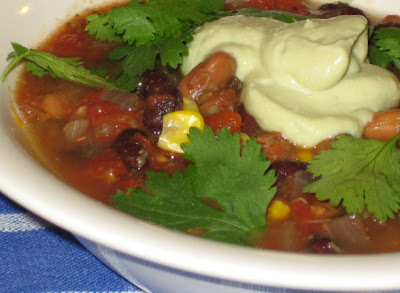 This is Mexican Bean Soup with Chipotle Avocado Cream. It's a new recipe. I know, I *shouldn't* be working on new stuff (I should be chillin')... but, I'm working on a set of recipes for the Food Network Canada website. Exciting, I know! This soup has fresh flavors from cumin seeds, jalapeno pepper, and lime, and is much lighter than what you might expect looking at the soup... it's not heavy like chili. 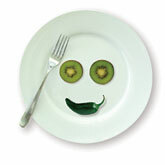 The best thing is that you will all be able to access these recipes from the foodtv.ca website. I'll let you know more when I have additional details. The not so good thing is that the Blueberry Oat Square recipe that I promised to post is part of my set of recipes for foodtv.ca, so you'll have to wait just a little longer for that one. But, back to a good thing (because who wants to end a post on a sour note? 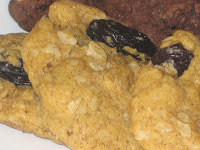 ), I've just posted the recipe for Oatmeal Raisin Cookies from ed&bv. that's cool! So, ok... When do u get your own show? That's so cool 'bout The Food Network (my fave channel). 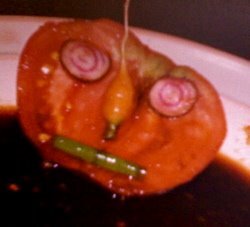 Congrats on the food network gig. When will you get your own show!!? You are just what that network needs! Dreena this is super exciting indeed! How awesome for you to be able to share the greatness of veganism on the Food Network. How could anyone resist that soup or those blueberry squares? oh my goodness gracious this is AMAZING news!!! I can't WAIT to see your recipe set on the Food Network Canada website!! I finally got around to trying the truffles in ed&bv. They are so good! I practically ate the whole batch myself. I turned them into spiders for halloween. It was perfect! Chipotle avocado cream sounds amazing! Can't wait for the recipes. Yum yum! That soup reminds me of Chipotle Bean Enchiladas with the Cashew Avacado dressing. One of my favs. We had the jumblelaya last night. It was so good. I also tried creamy raspberry oatmeal with celestial cream instead of the maple syrup. I had two servings. Hi, you asked about when my recipe zine was going to be available again, and it's ready! Um, there's a few cusswords in it though. I feel the need to tell you that because you're so mom-like! How exciting! I love that they are including vegan options.. how incredibly cool. Congrats about the Food Network recipes- if anyone can inject a little health and common sense into that network, it's you! hiya guys... thanks. I agree, it's terrific that food network is including vegan recipes in their website listings. It's very cool, I think! Katie, where on your site do we link to order the zine? Maybe someone here can shed some light. Because, I'm thinking I have total and complete mommy brain on this one! I want to bathe in that soup. Dreena, I just tried two awesome EDBV recipes tonight; the gluen free choc chip cookies (but without the chips, because I can't eat chocolate either!) and the sweet potato and peanut stew with chickpeas... both are delicious and were a big hit with my husband. The cookies are the best gluten free ones I have ever made. Love them. YAHOO!!! Thanks Michelle, I'm esp stoked that you loved the gluten-free cookies - I should have you test some I'm doing for the food network recipe set... if you're interested.